The news that Lompoc Tavern will soon close arrived Friday afternoon. I wasn't surprised. It has become increasingly difficult in recent years for established pubs and breweries to compete with a sea of newcomers that tend to have greater appeal among young drinkers. In the press release announcing the closure, owner Jerry Fechter talked about the challenge of operating pubs in various parts of the city and said it's time to sharpen the organization's focus on the pubs they have left...Fifth Quadrant, Oaks Bottom and Side Bar. This is the second Lompoc pub to close within the last year. The Hedge House on Southeast Division closed late last year and is now home to Little Beast. Lompoc had been a major player in the Portland market for many years, but its status is apparently waning. Recall that Lompoc Tavern is the descendent of the original Old Lompoc Tavern, founded in 1993. Fechter, who moved to Oregon from Ohio in 1989, got hooked on craft beer and homebrewing in the early 1990s. He wanted a brewing job, but couldn't find one. "McMenamins wouldn’t hire me," he told me in 2013. "I never got hired." He wound up working at Old Lompoc Tavern and they got interested in brewing in-house. He started brewing there in late 1996, marked as the beginning of Lompoc. The initial results were sketchy. "The first batch of beer was called Erstfest," Fechter remembered. "It wasn't good, but that's how I got started." Several years later, Fechter negotiated with the owners to buy the place. They worked out a deal that included all the appropriate numbers. At the point where everyone was supposed to sign, the owners backed out, saying they wanted more money. Fechter would need a partner. "That’s how I got partnered with Don Younger," he said. "Don and I met and chatted over several months on barstools in various places and eventually combined to buy the place. We renamed it New Old Lompoc." I never met Don Younger, who was a partner is several of the Lompoc ventures. He passed away in 2011, as I was starting to cover Portland's beer scene. But conversations with Fechter suggest to me that the partnership worked fairly well. Don was the wacky elder statesmen who knew the business; Jerry was the eager apprentice who took it all in, though they weren't always in sync. "I didn’t know how influential Don was until I started talking to him," Fechter told me. "He knew everyone and had been involved in craft beer from the start. Don was a character, always coming up with creative and crazy ideas." Fechter has an archive of stories. After Younger passed away, New Old Lompoc came under Fechter's control. But things were changing dramatically in the area. The building owner soon decided to demolish it and build something that's a better fit for the trendy Northwest neighborhood. When it reopened in 2013, the Lompoc Tavern had been reconfigured to fit a smaller space. The antiquated little brewery was gone, which helps explain the name change. Changes in the industry were also putting pressure on Lompoc. Portland's brewery count started spiraling dramatically upward around 2009. By the time Lompoc Tavern opened, the city had more than twice as many breweries as it featured only a few years earlier. Competition in the beer and pub business was stiffening. The press release says the crowd that supported New Old Lompoc found other places to go during construction and never returned when Lompoc Tavern opened. It also suggests business declined because a number of jobs moved out of the neighborhood. My own version is that a lot of options started popping up in the area. Breakside Slabtown, just a short walk from Lompoc Tavern, undoubtedly sucked business away after it opened in 2017. Other new places harmonize better with what the millennial crowd is looking for. Lompoc Tavern's final day will be Wednesday, Sept. 26. The lease is being taken over by Tap & Table, which currently has a location on Southeast Ankeny St. There will almost certainly be a gathering of regulars and friends on that last day. Note to self. There are those who will shrug at the demise of Lompoc Tavern. For them, it's a relic of a bygone era. That's one way to look at it. 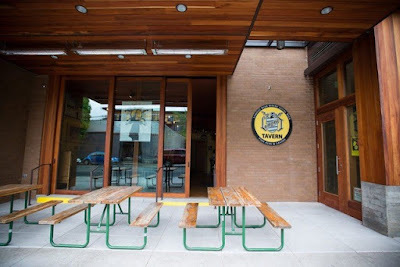 Another view is that a slice of Portland's craft brewing history is being displaced. There's an instructive tale here for established pubs and breweries.